functionality made available by the machine is implemented. structure of machine, which brings us to the some more hardware features. For example, IR<31..0> means bits numbered 31 to 0 of a 32-bit register named "IR"
be called op, with bits 4..0. In this section, we examine the various fields of an SRC instruction, using the RTL. this example), are named op, and this field is used for specifying the operation. stored in the register specified by this field. an operand, an address index, or a branch target register. conditional test, or a shift count. In some instructions, the bits 21 through 0 may be used as long displacement field. instruction depending on the operation. The bits 11 through 0 of the SRC instruction may be used for count or modifier field. following registers and bits together form the processor state set. order of execution of statements separated by "," does not matter. set run to 1, the statements IR ← M [PC] and PC ← PC + 4 are executed concurrently. evaluated before any left hand side is modified (generally though assignment). The RTL can be used to describe the dynamic properties. specified by the rc field, and store the result in the register specified by the ra field." specified directly. Instead, the effective address may have to be calculated at runtime. The displacement (or the direct) address is being calculated in this example. The ","
conditions, therefore, only one action will be performed at one time. to use the R [rb] field. instruction to be executed in a program execution sequence). 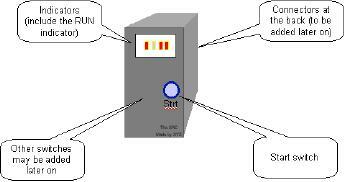 direct) addressing and the relative addressing is given. true, then Run bit (of the processor state) is set to 1 (i.e. true). conditional operations, which are inherently "disjoint". other in a loop. This is the fetch-execute cycle of the SRC. explained in this section earlier. the memory, at a displacement location `disp'. are stored back to the memory, at a relative address location `rel'. target instruction address specified by rb, if the condition `cond' is true. after a procedure call returns. that has 3 bits. This simply means that when c3<2..0> is equal to one of these six values. These conditions are explained here briefly. If the c3 field is 0, the branch is never taken. If c3 = 2, a branch is taken if the register rc = 0. If c3 = 3, a branch is taken if the register rc is not equal to 0.
by rc is greater than or equal to 0.
field c2, and the result is stored in the register ra. result is stored in ra. If the op-code is 15, the content of the register rc is negated, and the result is stored in ra. data in the field c2 is obtained and the result is stored in register ra. the result is stored in ra. rb added in their place. The result is copied to the register ra. shift right instruction. The result is copied to the register ra. circular shifting). The result is stored in register ra. used as a stall in pipelining. If the op-code is 31, run is set to 0, that is, the processor is halted. 31 would reach and halt the system. Note:For SRC Assembler and Simulator consult Appendix.